Zamboanga City. 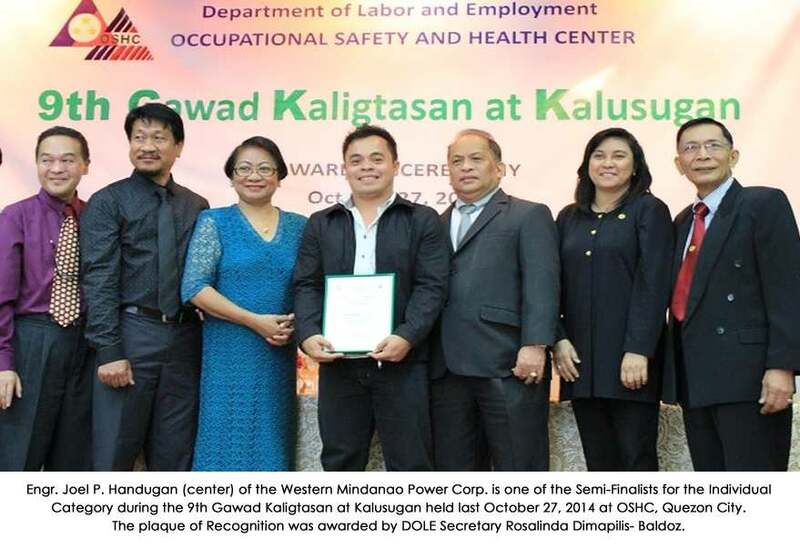 After the judging and deliberations, the Western Mindanao Power Corporation (WMPC) located in Sangali, this City, was bestowed the Bronze Award under the institutional category during the 9th Gawad Kaligtasan at Kalusugan (GKK) held on October 27, 2014 at the Occupational Safety and Health Center (OSHC) Auditorium, Diliman, Quezon City. The plaque of recognition was personally handed over by Department of Labor and Employment (DOLE) Secretary Rosalinda Dimapilis-Baldoz to Engr. Jose Mari Torrejon, Plant Manager, and Engr. Joel Handugan, Safety and Environment Officer, who is a semi-finalist under the individual category. The awarding was witnessed by DOLE-9 OIC-Assistant Regional Director Albert Gutib and Zamboanga City Field Office Chief Ian Lahi. Secretary Baldoz during her message emphasized that the GKK award is an inspiration to raise the bar of excellence in the implementation of occupational safety and health (OSH) at the workplaces. "The awardees of the coveted GKK are OSH champions and vigilant for the safety and health of workers," she said. The secretary challenged the awardees to sustain a very high level of awareness in terms of safety and health of workers and to always consider prevention as the highest priority. "We are synchronizing our programs with other government agencies toward remedial action to prevent accidents and occupational diseases at the workplaces," Baldoz added. DOLE-9 Regional Director Sisinio Cano congratulated WMPC for the award and encouraged other companies in Zamboanga Peninsula Region to vie for the prestigious GKK in 2016. He stressed that "we are intensifying our advocacy on OSH through trainings, orientations and other means of information campaign to prevent occurrence of accidents and incidents including diseases at the workplaces. Our partners from the ZamPen Occupational Safety and Health Network and the ZamPen Tripartite Industrial Peace Council are very active in OSH promotion for a Zero Accident region". OSHC Executive Director Ma. 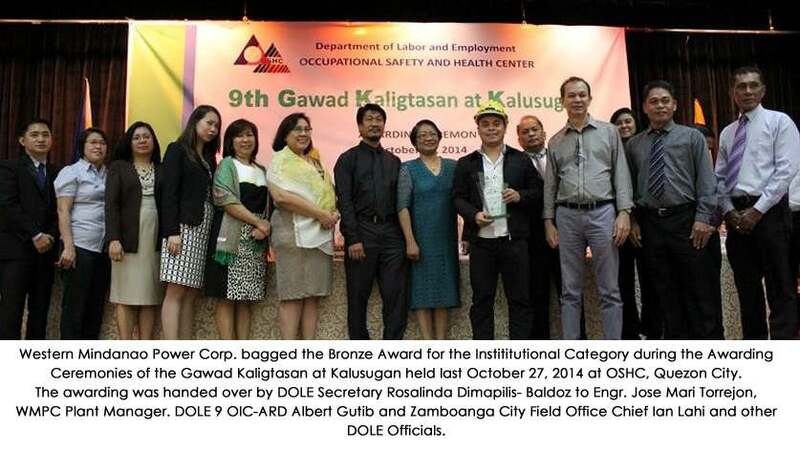 Teresita S. Cucueco disclosed that the GKK is a national award given by DOLE in recognition of the outstanding achievements of establishments and individuals in terms of responding to the safety and health needs of the workers, workplaces and community. Dr. Cucueco further said that for this year, 241 entries from various industries vied for the honor of being lauded with the GKK Champion, GKK Finalist-Silver Award, and GKK Finalist-Bronze Award for their commendable achievements. Of these entries only 15 received their respective awards.